The 14 songs in this collection were written to accompany my lessons while working in schools as a peace educator. When I wrote them, I had no idea that they’d ever be recorded or eventually be used in classrooms around the country! People say that the CD is unusual in the realm of children's music, not only due to its musicality, but also because the lyrics offer important skills and concepts in social emotional learning. The issues addressed in the songs are very real for students -- e.g. boys needing to act tough in order to fit in, peer pressure around clothing, and the hurt and anger around a broken confidence. Parents report to me that the songs alone have helped their children learn how to handle challenging and painful situations with peers. The diverse music and mix of performers (hip-hop, gospel, Celtic, blues and more) reinforce the message of inclusion that I hoped to communicate. Including the voices of inner city students was important to me, too. I’m told that students of all backgrounds and ages love the music, from pre-schoolers who love to move with the rhythms, to junior high students who find resonance in the lyrics and ideas. I hope you'll listen, read more, and consider purchasing the CD for the budding peacemakers in your life! 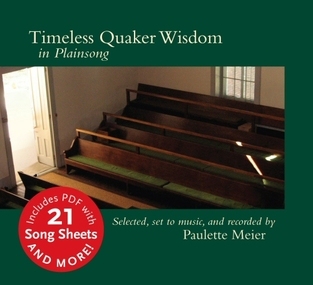 This collection of 21 chant like songs developed over time, as I discovered the writings of early leaders of the Religious Society of Friends, known as Quakers. I was stunned by the insights of these 17th century men and women whose more mystical understanding of early Christianity, gained from their individual and collective spiritual experience, shook them to the core and allowed them to stand strong in the service of truth, love and integrity. I began setting some of the texts to melody as way to memorize and internalize the messages. I hope you'll listen to these resulting "song-chants," and see how you might incorporate them into your own spiritual practice and search for truth! Singers like Pete Seeger, Joan Baez, Holly Near and so many other great performers who sing about what they believe in and about what's going on in the world have always inspired me. In the 1970's, when enough people helped me realize that I had a good voice and could sing, I began using it to sing out in the same tradition as they did. I've sung at hundreds of gatherings over the years in the cause for peace and justice and care of the earth. My most recent outlet for being able to do this is with a trio we call, "Just Earth." Jamie Fota and Len Webb and I make up the group, with other friends stepping in now and then. Jamie is a dynamite guitarist and vocalist, who also writes her own songs, and Len is an amazing percussionist, who also sings and plays harmonica, trumpet and any number of other instruments. We don't have an album recorded yet, but hope to do so during 2014. I'll post some mp3s on this site with some of the songs we've recorded on home equipment thus far.